When a client leaves your offices, you need to terminate their licence in order to ensure that no more bills are issued to their account. You can terminate the licence as soon as the customer vacates your office. Your client gives a notice - To set this up, go to the licence and place it under notice by adding a Notice date and expected move out date. 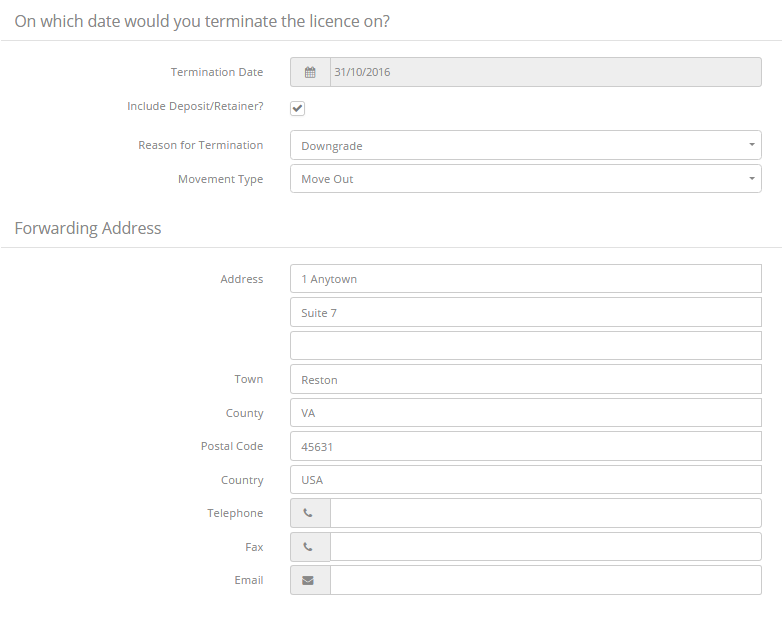 Operate then adds a termination date to all licence related documents. If yes, take no action yet. If the client needs to extend occupancy then extend the licence from the Licence page. Send your client an inventory list by running the Inventory report. Terminate the Licence. To do so, go to Member > Licences, edit your desired licence and click Terminate. Choose whether you want to include the Deposit/Retainer - This will create a credit note corresponding to the deposit/retainer amount existing on the customer’s account, thus refunding the deposit/retainer. Choose a Reason for Termination. Select a Movement Type - In the case of a leaving customer, select Move Out. Add a Forwarding Address, to be used for any mail correspondence arriving to your offices after the client has vacated. Click OK to complete the licence termination, which will take effect immediately. Create a final bill run to generate an invoice for any unbilled charges on their account. Refund the Deposit (from your Accounts Receivable section) after the client has left. Once you can be sure the client has no further charges then end the acount by adding an end date and changing the Account type to Ex-client. Note :- Any debts that the client has are not affected by the termination of the license. Note 2 - If the client has any payments made in advance, the licence termination process will not automatically credit them for the paid amounts. These payments need to be identified in the customer's Accounts Receivable record and credited either by creating a credit note or using a Journal Credit.